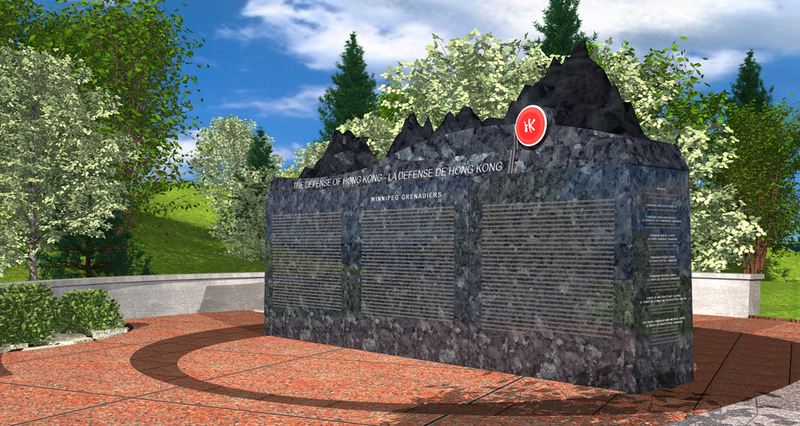 The original design of the Memorial Wall has evolved over the two years since the Calgary Convention. 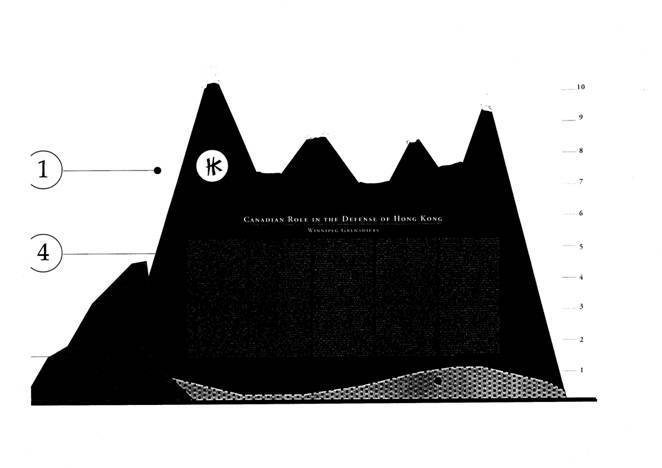 As you will notice, there have been four mountains added on the top representing the four mountains in Hong Kong where Canadians saw battle. The Wall will be slightly larger to ensure its prominence as the focal point of the site. Ignore the “1" and “4" indicators. These are design note indicators for footnotes not included in this view. The site will be landscaped to represent a Harbour concept. Surrounding the Wall will be grasses to link in the Western Canadian contribution to “C” Force. The granite at the base of the Wall will come from Quebec to link in the Eastern Canadian contribution. There may be minor additional changes to comply with environmental and geophysical demands. A multi-dimensional display will be made available once the final requirements have been established. As members of the Hong Kong Veterans Commemorative Association, we hope that you will solicit funds from individuals of the HKVCA family and friends towards the Memorial Wall. Please use this UPDATED brochure (PDF) with your request as it contains the information that a donor would like to know. Engaging the interest of local Corporations and agencies in our Memorial Wall is a great way for us to make progress and we will acknowledge these donations on this web site. Want to help in this effort? Please contact the Committee who have packages prepared to help you. If you wish to have an event to raise funds, please contact the Memorial Wall Committee for guidance.